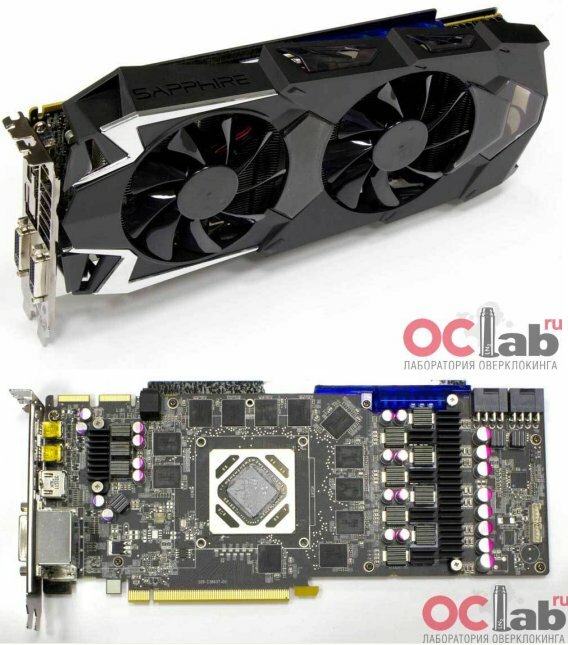 TechPowerUp came across details and photos of the Sapphire Radeon HD 7970 Toxic 6GB video card at OClab.ru. This custom-design card features a core clockspeed of 1150MHz and a whopping 6GB GDDR5 memory clocked at 6000MHz. The cooling solution features a large, monolithic aluminium heatsink that dissipates the heat of the GPU and memory chips, while the FETs are cooled by additional heatsinks. The heatsink features four 8mm nickel-plated heatpipes, a vapor-chamber plate and two 80mm fans. The memory chips on the reverse side of the PCB are cooled by a metal backplate. The PCB and cooler are designed from scratch, by Sapphire. The PCB accommodates 6 GB of memory in 24 GDDR5 memory chips, 12 on each side. To power the factory-overclocked 28 nm "Tahiti" GPU and 24 GDDR5 7 GT/s memory chips takes some really strong VRM. Sapphire implemented an 8+3 phase power supply, that makes use of solid-state chokes (don't whine under stress), and International Rectifier DirectFETs. The VRM draws power from two 8-pin PCIe power connectors. The VRM includes, we're told, a very high-end controller that provides a lot of software features. On the card, Sapphire implemented LEDs for each of the 8 vGPU phases, that gives you a real-time indication of their individual loading. These LEDs can be seen through a window on the top of the card. OCLab managed to overclock the card to 1300MHz (core) and 7600MHz (memory) with the card's included cooler.